U.S. stocks were poised for a lower open Thursday, as disappointing reports in Asia and Europe showed that business everywhere continues to stall. 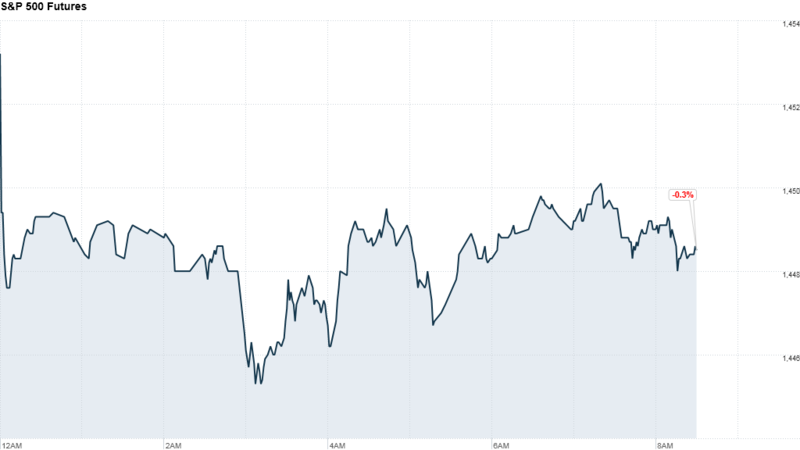 Dow Jones industrial average, S&P 500 and Nasdaq futures were down more than 0.2%. An HSBC report on Chinese manufacturing, its preliminary purchasing manager's index, showed that manufacturing in the world's second largest economy ticked up slightly in September but still contracted. Asian markets responded by closing in the red, with the Shanghai Composite losing 2.1%, the Hang Seng in Hong Kong shedding 1.2% and Japan's Nikkei dropping 1.6%. It was similar in Europe, where Markit's regional purchasing managers index fell to a 39-month low. It showed the fastest contraction of new business and services in more than three years, and European stocks all dropped in midday trading. Britain's FTSE 100 was down 0.7%, the DAX in Germany dropped 0.5% and France's CAC 40 fell 1%. U.S. investors began Thursday with data on first-time unemployment benefit claims, which came in at 382,000 for the week that ended Sept. 15. Although the Labor Department figure is down 3,000 from the previous week, it's still not low enough to ease worries about continued high unemployment. On tap later in the morning will be a monthly regional business outlook survey released at 10 a.m. by the Federal Reserve Bank of Philadelphia. There is hope this report will be positive and counteract the ill-received manufacturing survey released earlier this week by New York's Fed branch. A t the moment, investors appear fearful of doing much with stocks as they try to get a handle on where the economy is headed. Recent actions by central banks around the world have fueled these concerns. On Wednesday, the Bank of Japan announced it is expanding its asset-purchasing program. A few days earlier, the Federal Reserve announced a third round of the asset-purchasing program known as quantitative easing. And before that, the European Central Bank revealed a new bond-buying program. Whatever rallies followed those moves have since dissipated, and U.S. stocks ended just about flat Wednesday. Companies: ConAgra Foods (CAG) shares shot up more than 6% in premarket trading after the food processing company beat expectations by reporting earnings of 44 cents per share. Shares of the nation's largest car retailer, CarMax (KMX), rose more than 3% even though its earnings per share of 48 cents fell below estimates. The car seller reported stronger sales of used vehicles and plans to double the rate of store openings next year. Rite Aid (RAD) shares also rose more than 1% after the drugstore chain's reported loss of 5 cents per share came in smaller than anticipated. Investment bank Jefferies (JEF) is also due to report its quarterly results before Thursday's open. Business software maker Oracle (ORCL) reports after the closing bell. Analysts surveyed by Thomson Reuters expect Oracle to report earnings of 53 cents a share on $8.4 billion in revenue. Shares of railroad operator Norfolk Southern (NSC) sank in after-hours trading Wednesday after the company lowered its third-quarter guidance. Fellow rail transport firms CSX (CSX), Union Pacific (UNP)and Kansas City Southern (KSU) also fell on the news. Shares of Bed Bath & Beyond (BBBY) dropped in after-hours trading Wednesday after the retailer missed earnings estimates. Online real estate site Trulia announced late Wednesday that it had priced its initial public offering at $17 a share. The company will begin trading on the New York Stock Exchange Thursday under the symbol "TRLA." Currencies and commodities: The dollar rose against the euro and British pound, but it fell versus the Japanese yen. Oil for October delivery fell 89 cents to $91.09 a barrel. Gold futures for December delivery fell $9.30 to $1,762.40 an ounce. Bonds: The price on the benchmark 10-year U.S. Treasury rose, pushing the yield down to 1.73% from 1.78% late Wednesday.